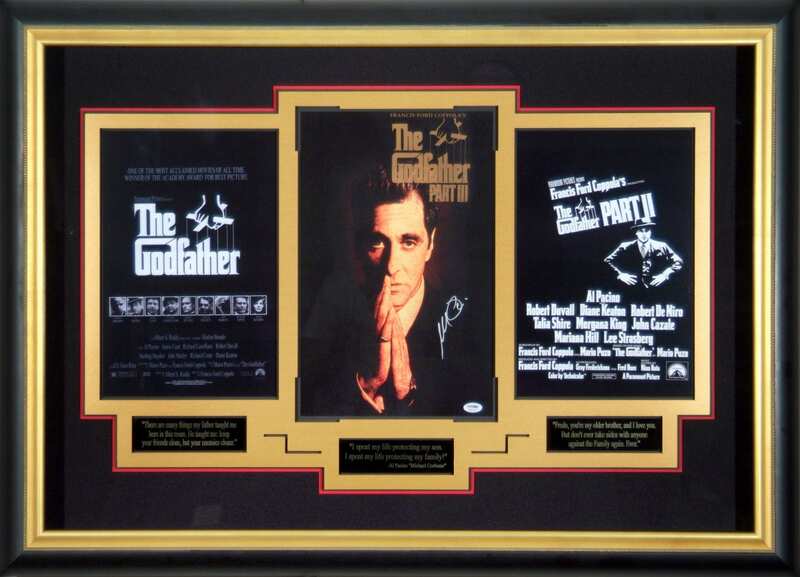 Featuring an 11x17 poster for The Godfather III authentically hand signed by Al Pacino. Framed with additional posters from Part I and Part II and quote plaques from each movie. Witnessed, Examinied, and Certified Authentic by Millionaire Gallery. This item comes fully certified with a certificate of authenticity. All signed items come complete with certification which includes tamper-evident hologram and accompanying certificate of authenticity card. Unsigned items do not require certification. Comes fully certified with Certificate of Authenticity and tamper-evident hologram. Also backed by HollywoodMemorabilia.com's Authenticity Guarantee. Item ships FREE. Made to order product, usually ships in 7-10 business days.